Compared to most subcompact crossovers in the North American market, the Honda HR-V is relatively new. It arrived for the 2016 model year, and the 2019 version marks its fourth. Facelifted to indicate a midcycle refresh, the Honda HR-V now has Sport and Touring trims in addition to the LX, EX, and EX-L. In ascending order, the trims are the LX, Sport, EX, EX-L, and Touring. Powering the 2019 Honda HR-V is a 1.8-liter inline 4-cylinder engine that provides 141 horsepower and 127 lb-ft of torque. It is connected to a continuously variable transmission (CVT), which gets rid of gear shifting for a smoother and more fuel-efficient ride. Front-wheel drive is standard, and you can upgrade to the all-wheel-drive system for better all-weather driving performance. If you go with any trim above the base-level LX, Honda will add dual-mode paddle shifters with the CVT. 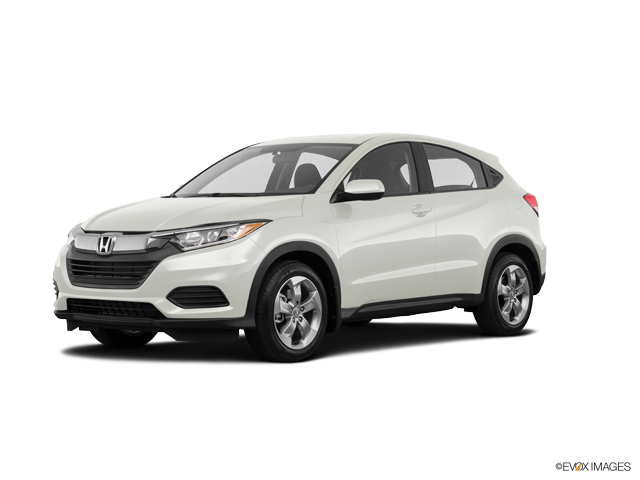 With two rows of seats for accommodating up to five people, the 2019 Honda HR-V gets the front-seat heating ability at the EX trim level, leather upholstery at the EX-L trim level, and 8-way power adjustability on the driver’s seat on the top-level Touring. For comfort and convenience, the crossover SUV starts with features such as cruise control, remote keyless entry, Bluetooth®1 wireless connectivity, a four-speaker 160-watt audio system, a USB port and auxiliary audio jack, and a 5-inch color LCD screen. At the Sport trim level, Honda adds Active Noise Cancellation™ acoustic technology, two speakers for 20 watts of additional audio power, another USB port, HondaLink®2 remote connectivity, and hands-free text messaging. The Sport trim level is also where Honda adds brand-new features for 2019, which are a 7-inch color touchscreen and smartphone integration via Apple CarPlay™3 and Android Auto™4. Automatic climate control, HD Radio®, and a trial SiriusXM® satellite radio subscription are added on the EX and higher. The EX-L and Touring have an auto-dimming rearview mirror, and unique to the Touring are a garage-door opener and a voice-activated 7-inch touchscreen navigation system. For safety, the 2019 HR-V has six airbags, multi-view monitoring camera, electronic vehicle stability control, an anti-lock braking system, electronic brake-force distribution, brake assist, traction control, hill start assist, LED daytime running lights, and a theft-deterrent system that combines remote keyless entry with engine immobilization. At the EX trim level, Honda introduces Honda LaneWatch™ for lane changing guidance, as well as Honda Sensing®, which is new to the HR-V for the 2019 model year. Honda Sensing® is a suite of driver-assistance technologies that comprises adaptive cruise control, road departure mitigation, forward collision warning, lane departure warning, collision mitigation braking, and lane keeping assist. Fired up about finding out more of what the 2019 Honda HR-V has to offer, call us today at our dealership in Michigan City, Indiana. With great aggregated reviews on Google, Cars.com, and DealerRater.com, we make customer satisfaction our top priority. Set up an appointment with us so that one of our Honda specialists can assist you with your new car purchasing needs.